I have been craving homemade cinnamon rolls for quite some time. I am not sure why I was so intimidated by the idea of making them from scratch. I guess it was because I wasn’t sure if I could get the cinnamon roll dough perfect. For my homemade cinnamon rolls I didn’t want to rely on vegan butters like Earth Balance. I wanted to try and use melted coconut oil instead. So I just dove right in and tried them. I have to say that I am pretty happy with the way these vegan cinnamon rolls turned out. 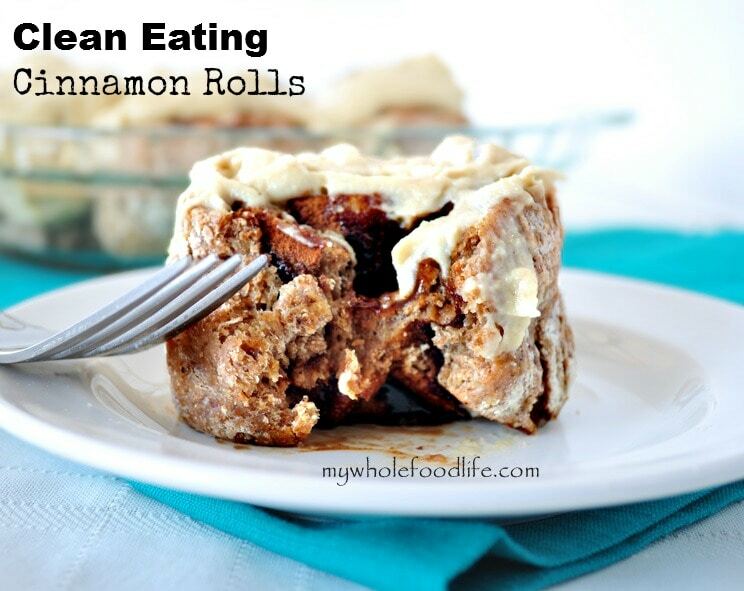 I used spelt flour in these vegan cinnamon rolls, so they are not completely gluten free. I wanted to perfect the recipe before attempting to make the cinnamon rolls gluten free. This would be a fantastic weekend breakfast! Recipe is adapted from Chocolate Covered Katie and Veggie and the Beast. Warm cinnamon rolls with a cashew cream icing. Mix the dry ingredients for the dough in one bowl. In a saucepan , heat up the almond milk. Once it starts to bubble, add in the coconut oil. Let the almond mixture cool slightly and then add it, and the flax egg, to the dry ingredients. Meanwhile, mix the cinnamon and coconut sugar together for the filling. Once the dough has risen, roll it out onto a floured surface. Brush the dough with water and sprinkle the cinnamon/sugar mixture on top. Roll up the dough and cut into pieces using a bench scraper . Place the rolls in a greased pie plate and let it rise another 20 minutes. Once the dough is ready, bake it in the oven for about 15-20 minutes. While the rolls are cooking, in a blender , blend up the cashews and maple syrup tp make the icing. If it seems a little thick, you can thin it out with a small amount of milk. Pour the icing over the rolls while they are still warm out of the oven. These rolls should be stored in the fridge. You can probably freeze them, (minus the icing,) for longer storage. If the icing thickens up after it's stored in the fridge, just add a bit more milk and blend until smooth. I have these in the oven right now. Can't wait! When rolling out the dough, I used at least an extra cup of flour because it was sticking to the pin. When I measured out the flour, I used the fluff, scoop, and scraped method. Did I do something wrong? I think I measured it when it was packed with flour. I hope they turn out okay for you. Do you think you could use coconut flour in place of the spelt? would you need to add an extra egg? Thanks! Love your recipes!! I ended up using white whole wheat flour instead and we loved it! It worked amazing! when I come across spelt I may pick some up; otherwise I will keep making it this way bc it is really a great recipe. Thanks! Thanks Wendy! You can find spelt at most grocery stores. I love baking with it. Could you use 1/2 almond, 1/2 coconut flour for these? I don't have any spelt flour on hand. That may be a tricky substitute. If you are going to use almond flour, you will need a lot of eggs. Not sure if coconut flour will work at all. It can be tricky to bake with. I was wondering if you used instant yeast or traditional and how much one package is? Thanks! I used traditional yeast. I think it is 2 1/4 tsp. You're welcome! I hope they enjoy them! I'm wondering about the vanilla. I don't have vanilla bean. Can I use extract? may be a silly question, but what do you soak the cashews in? Just water or Almond Milk?? No questions are silly. :) I soak them in water. I'm excited to try this recipe but I've never actually worked with raw cashews before. What's the minimum number of hours that would be considered "overnight" for the soaking of the cashews? How do I know if I've soaked them long enough or not? Is there a maximum? I mean, is it possible to soak them for too long? There is no maximum for soaking, however, if you plan on soaking longer than a day, change out the water. I think the shortest time to soak would be 6 hours. Would this work with oat flour? Also, what kind of yeast should you use?? I just used regular yeast. This should work with oat flour if you add an extra egg. Would I be able to make it ahead of time up until the baking part by putting it in the fridge overnight and then baking it in the morning? Would some other type of flour work for the rolls, as I cannot have spelt flour? What type of flour do you have? I have had some readers make this with gluten free oat flour, but they had to add an extra egg. I would love to try these but I can't have wheat flour or spelt as I have celiac disease. What gluten free flours do you think might work as a substitute? I can't have seeds either so do you think a gelatin egg would works as a sub for the flax egg? Thank you! I have never used a gelatin egg, so I am not sure how to answer that. I did have a few readers make these with gluten free oat flour with success. They did have to add an extra flax egg though.